Also, your character could die during character generation. Or so I am told. …the support group really was pretty dandy. It was something special. It was founded by a woman who’d worked successively at Apple, and then Microsoft, and then Google…. before she rolled neurochemical snake eyes and a bout of clinical depression knocked her out of the sky…. So she retired early and started Free Trader Beowulf. 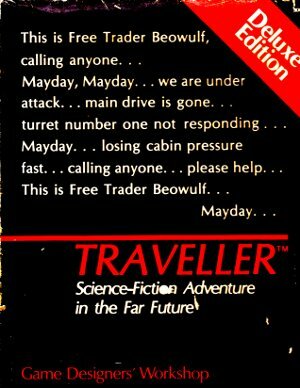 Free Trader Beowulf—you had to be at least forty and a recovering pen-and-paper role-playing-gamer to get the reference, but it was apt. Google it. If D&D references have become commonplace, then a Traveller reference is at least kicking it up a notch. Mark my words, next year it’s going to be Tékumel and Tunnels and Trolls references. You read it here first! I knew a T&T reference would attract your attention, Ed 🙂 Is “Take That, You Fiend” the name of a spell or attack in T&T? And yes, I think w/r/t our friend Free Trader Beowulf, we’ll have to assume it’s being broadcast locally in a populated system, or near a heavily-trafficked trade route stopover, or something. I love settings that (attempt to) take seriously the ramifications of very limited FTL technologies. Old-school Battletech had elements of that too, although I don’t think they stuck to it quite as strongly as Traveller did. I know there was one faction that had a monopoly on FTL travel; but I don’t recall if they found some way to handwave FTL communications or not. I love the idea of a no-FTL-comms setting, where super-fast-moving couriers, messengers, blockade runners, etc. (i.e., player characters) would be in huge demand. Man, now I’m in the mood for some Traveller. I read that passage in “The Magician King” to my wife, who then asked me what that was in reference to. I had to think a moment, but then said “Its a standard class of Traveller space ship. Beowulf must be the name.” I had to take out the damn book (the hardbound) and leaf through to page 143 to find the Beowulf sample scenario, but I did. So this morning my daughter saw the UPP decoder I made for quick study of subsector maps and told me I had to redo it with cleaner handwriting. The academia of gaming continues down another generation. Mr. Gygax, you should be proud of what you wrought! Lev Grossman also uses “Free Trader Beowulf” as the title of his website (you can see it if you google the phrase, or if you view source in his page). I hadn’t noticed that, Mark–thanks for pointing it out! « Why Are Gary Gygax’s D&D Modules Still Unavailable?